The Unitary Patent is a proposed European regulation that was first published in April 2011. Its aim is to unify patent titles and their jurisdiction between willing Member States, via an enhanced cooperation. The underlying idea to this project is not a problem in itself. However, the mode of application currently considered are a source of concern for April: most of the project's modes of application would be entrusted to the European Patent Office (EPO), whose excesses towards software patents have long been denounced by April. Indeed, since its inception, the EPO has been a strong supporter of software patents, even though software patents are prohibited by EPO's founding charter, the Convention on European Patent. To reach this conclusion, the EPO developed an artificial distinction between software "as such", which cannot be patented, and software associated to an invention or a physical support, which may be patented. This way, the EPO granted patents for software that had a "technical effect", even though this wording does not hold any meaning. This induces also many negative consequences, as demonstrated by the software war waged between Apple and Samsung in the Autumn of 2011. These excesses are dangerous for innovation as a whole and especially for Free Software, as April pointed out in its summary of the software patent situation (in French). Software patents hinder creation and constitute a significant cost for companies. 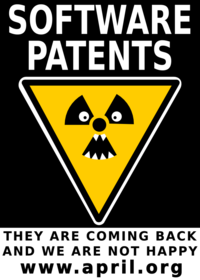 More than anything, software patents put into question the very concept of Free Software by challenging the idea that idea may range freely, i.e. cannot be attributed and only their material implementation can be attributed. The project is currently being debatted by the Commission of Legal Affairs of the European Parliament. April suggested improvements on the project so that it complies with law and democratic rules. For detailed information on the unitary patent, visit the website unitary-patent.eu/ or its French version brevet-unitaire.eu. See the rest on the page with articles on software patents.